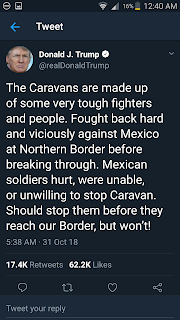 1) Trump launches surveillance drones to report on "the invaders" in the caravan while they are in Mexico. Drone footage shows caravan of migrants in southern Mexico. 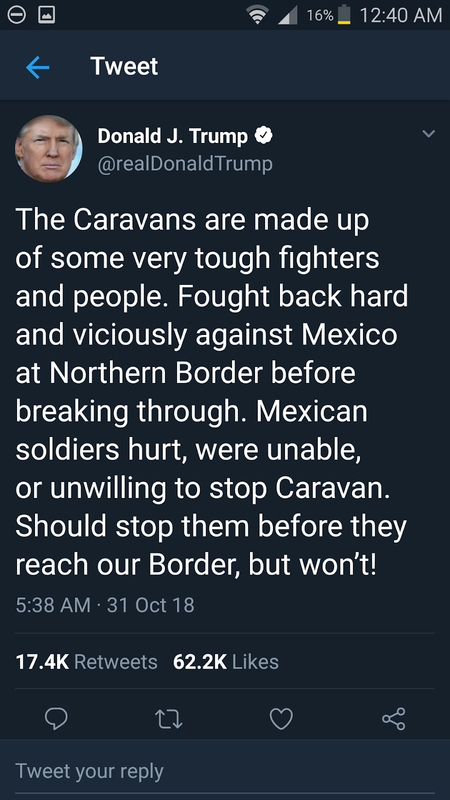 2) Trump says the surveillance drone footage shows there are some really "bad hombres" in the caravan who are using the women and children as cover. Here are Trump's real October 31st tweets. 3) Trump tells "the invaders" to disband and stop coming. If they don't stop he will launch an airstrike. (This will bring up comparisons to Obama ordering airstrikes in foreign countries and allow a flurry of "both sides do it" stories in the media. Trump will take advantage of the executive power granted to Obama by congress to launch drone strikes in foreign countries, so questions about its use in Mexico will only be about breaking "norms" not breaking laws. 3) Mexico will see this as an unwarranted attack on their sovereignty and respond, saying that they will shoot down any drones in their airspace. 4) Trump will claim that he has a responsibility to protect America and---since he doesn't have a wall yet---he has to act. 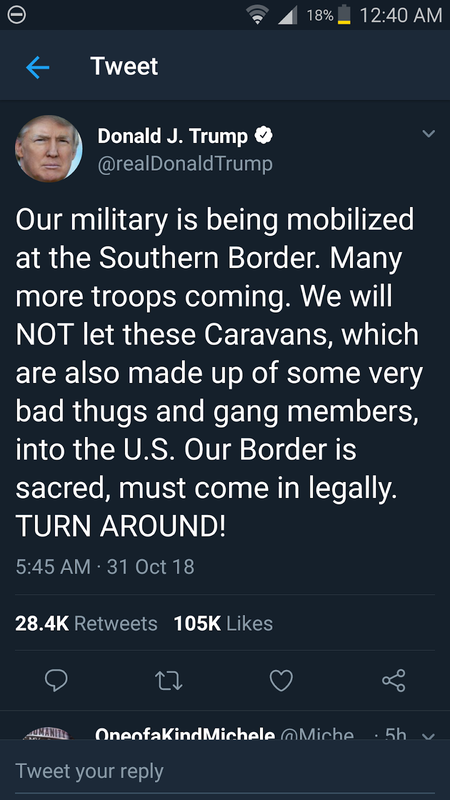 The caravan doesn't disband after his warning, so Trump sends a drone. 5) The drone will kill some people who Trump says are "bad hombres" He will claim to use intelligence about the "bad hombres" gathered in the same fashion Obama did. The use of this method is suggested by John Bolton. Any criticism about the process will end with, "Obama did it." Women and children will be accidentally killed, but so did strikes run by Obama. Alternative 5a) Drone is shot down by Mexico before the strike. 6) Trump declares war on Mexico for their response in aiding and abetting invaders. 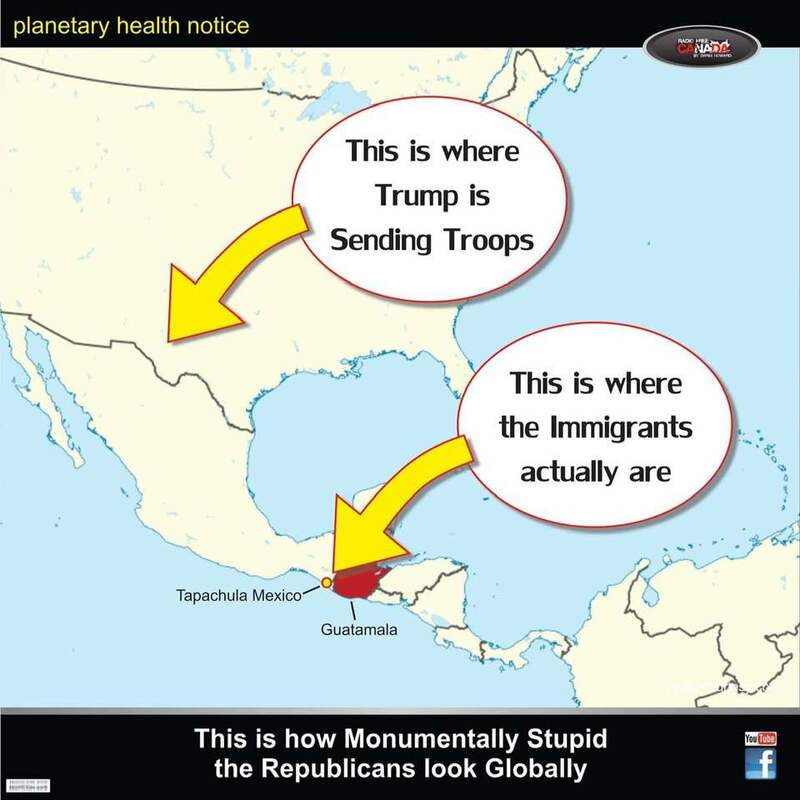 7) Trump tells the Mexico that they either stop the invaders or he will send in his own troops that are already massed at the border. 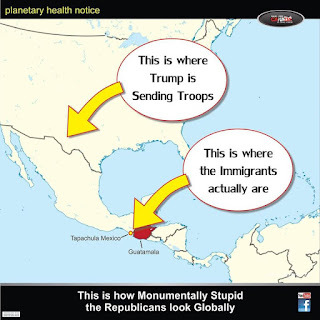 (Trump can't order military action on US soil, but if they move to Mexican soil they can attack to retaliation for shooting down a US drone and to take out the invading caravan. 8) Because Mexico doesn't want to have a war with Trump, they are forced to act, which is what Trump wanted. 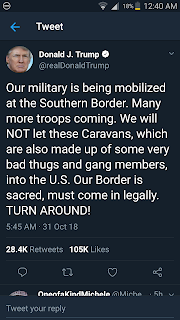 Mexico sends in local troops to break up the caravan. 9) Trump "wins" showing he is tough on illegal immigration. This escalation all happens before midterms while the GOP still controls the House and Senate. Scary enough for ya? Happy Halloween!